Gila Wilderness, circa A.D. 1200 to 1450. 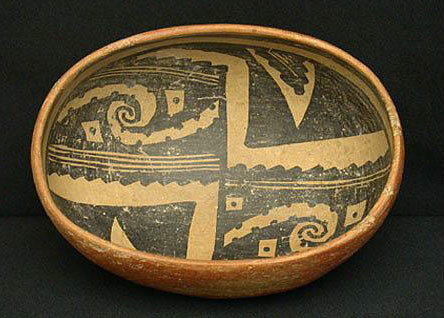 This bowl, of elongated oval form, is painted on the interior in black against a creamy buff colored slip, with two opposing spiraling, possibly avian elements in an intricate angular geometric composition; decorated on the exterior with a brownish-red polished slip. Provenance: From an old private collection of fine early pottery in New Mexico, originally collected many years ago in Arizona. Condition: Aside from three very minor chips to one side of the rim, some tiny losses to the black interior paint, this bowl is unbroken, and in excellent condition.